My DQS8 quilt top is done! After much anxiety (the good kind) and searching, I finally found the inspiration I needed to design my doll quilt. 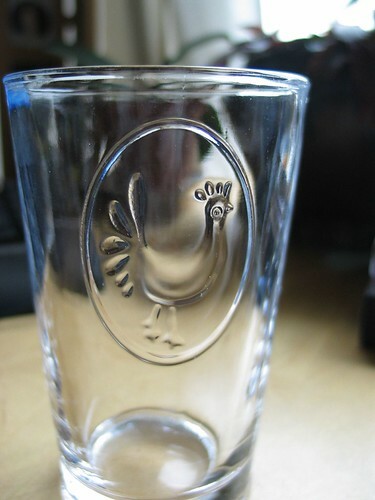 Lots of internet scouring for rooster images turned up several copyright-free designs and I was all set to do some redwork embroidery, but something wasn't quite right. The roosters seemed too fussy, too frilly, too complicated. Then it hit me; the image that would make a perfect applique was right in my hand! Holding my water! I sketched out the rooster, decided on some stash fabrics that are my partner's favourite colours, found some Wonder Under and got busy with the applique (a sneak peek of which you've already seen here). I made lots of 1/2 square triangles although I wasn't sure what I was going to do with them...but it seemed like a flying geese border would suit the birdy theme. It's certainly colourful! Split flying geese are not for the faint of heart when it comes to pressing (I made an effort to press to the coloured fabric, so seam allowances wouldn't show through the white). Tricky! I sewed very carefully but still managed to lose a few points....not to worry, hopefully Mr. Rooster is enough of an attraction that all eyes will be on his jaunty tailfeathers. 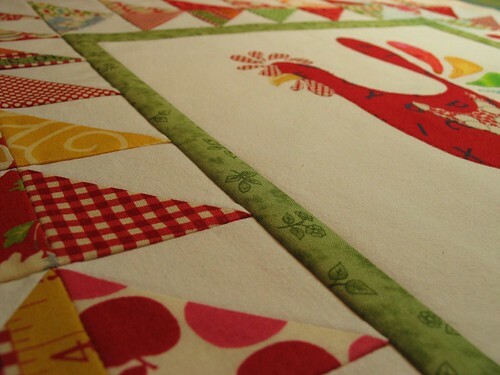 My first quilting plan was for simple diagonal lines, but after putting on the masking tape in one direction, I wondered how it might look to tape up the other diagonal and quilt the resulting open squares. The palest blue thread seemed a good colour for a lattice-look coop. Good thing the Gathered Threads are getting together this Friday because I've got plenty of ends to darn in. Hopefully the binding will be on so I'll be able to stitch that down as well, for a finish before the weekend!! This rooster will have to sit tight for a month as our swap mommas have given us strict instructions not to mail before the end of February, in order to maximize the suspense for our partners. 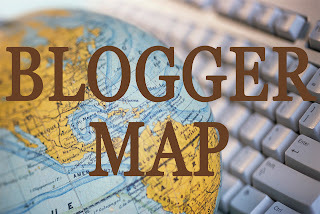 All of the work being posted in the doll quilt flickr group is incredible - I can't wait to see which amazing quilt will end up in my mail box! Wow! 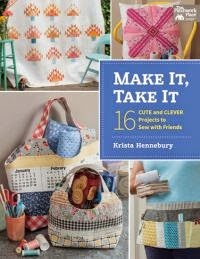 from inspiration, to fabric choices to quilting design, and all those HSTs, it is fabulous! Bet there'll be a lot of people hoping it's heading their way! This is absolutely gorgeous. Very lucky is the person who finds this in their mailbox! Fabulous Krista! Can't wait to see it in person on Friday. The coop quiltin', the Rooster, the colors, Everything! How creative you are! I'm likin' the rooster! that is SOO cute! 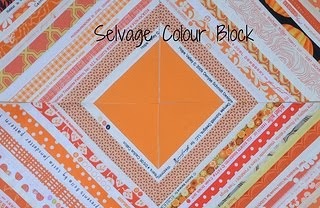 thank you for showing the masking tape....it gives me an idea for a quilt i need to make. I LOVE your rooster.... he's really quite cute!! 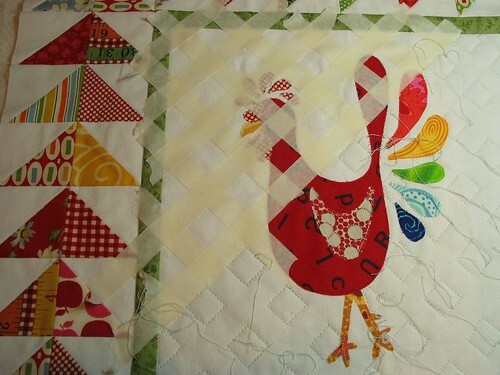 what a neat idea the square "rooster coop" stitch! 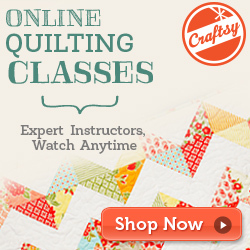 Fantastic way to quilt little diamonds!